Link to Almond Cookie Dough recipe. GV comments: I substitute vegan butter for the dairy butter, and this recipe works perfectly that way. I can't decide on my favorite variation. If I had to, I'd pick the Chocolate Thumbprints, but all three are gorgeous and delicious. This dough comes together very fast in the food processor (under 10 minutes). The longest part is the chilling time (2 hours or overnight). 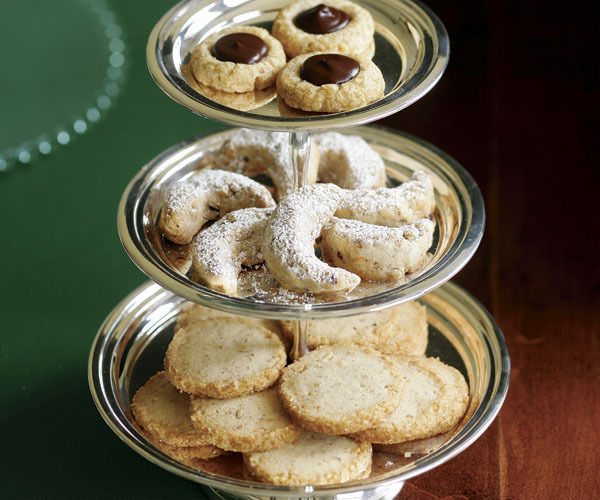 These are fabulous as part of holiday cookie gifts or as part of a holiday buffet. Timing: Making the dough, about 10 minutes; it needs to chill for at least 2 hours; then the cookies take 15-25 minutes to bake.